Even if you don&apos;t have a four-year-old thick in the throes of a dinosaur obsession, The Museum of Ancient Life at Thanksgiving Point is worth a trip. As a mother of two busy kids under five, the best part of the museum to me is the fact that it is more hands-on than hands-off. 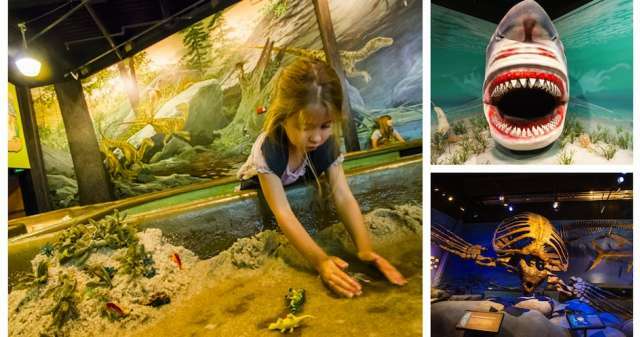 Of course, you don&apos;t have to be under five to enjoy climbing on dino bones or experiencing first hand the effects of erosion. The museum is quite the sensory experience. One of our kids&apos; favorite exhibits is of deep space. Standing on a black, metal walkway, suspended in a black tunnel, lit only faintly by thousands of little "stars" you feel as if you actually are suspended in space. It is quite magical! The exhibits invite exploration and discovery and there are layers of learning for all ages. As my children run and touch and climb, I trail behind them, reading the information plaques and examining the detailed timelines and exhibits. Read more from Amy Thompson at Progressive Pioneer.